Just wanted to thank everyone for all the well wishes and prayers over the last few days. Liam is doing amazing considering everything that went down the past two weeks. He is up on his feet and even made it to school on Valentines day to see all his buds and score some candy. We still have some planning to finalize, but it is looking like we will be in active treatment for about 9 more months. The treatment will consist of radiation and Chemo, which both start this week. We will be trying a new type of antibody as well in the coming months and we will share more on this journey as we conquer each new challenge. I figured a few pictures would tell a better story on how Liam is feeling than another rambling post. We wanted to thank our buddy, the amazingly brilliant and kind Nate Smith, for hosting a wonderful adventure into the secrets of the field Museum collect. Liam always loves when Nate shows us around. 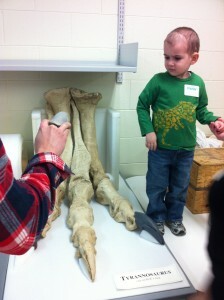 Click here to check out more pics from our day with the Dinos! Liam with a casting of Sue's foot.